Science is the search for patterns. When you are able to identify a pattern, you use calculus to predict an arc which allows you to intersect at one or several points and effect a desired change. I see patterns. Employing the ingredients of not so “benign neglect,” a bought-off major press and an ignorant, compliant or corrupt band of politicians, the “Evil Axis” of society fluffs, Bechtel, greedy realtors & developers is poised to rip off billions of dollars from local tax payers. Case in point … if y’all think the recent spate of stories describing the imminent collapse of the 160-mile drainage ditch running from Yosemite to San Francisco is not a coordinated effort to force the SF Board of Supervisors to back off any challenge to Bechtel … if you think the stories are coincidences … you are an idiot. If, on the other hand, you buy my conspiracy theories … you are brilliant. There are Roman aqueducts over 2,000 years old still carrying water to Rome. The Coliseum in Rome is over 2,000 years old. With only a few patches, the Hetch Hetchy, Candlestick & the Trans-Bay Terminal could last another thousand years. Ya know how to judge a concrete pour? If you put the rebar less than three inches from the surface, you’ll get that particular piece of surface to pop off after a few decades. The interior? It only gets stronger. Hetch Hetchy is a rock (literally). As is Candlestick. As is the Trans-Bay Terminal. Yet crooked politicians and reporters have joined en masse to flesh out a public relations effort to convince you that these structures need to be replaced. Why? How’s abouts for over $6 billion flowing into the pockets of the already grotesquely bloated San Francisco rich? 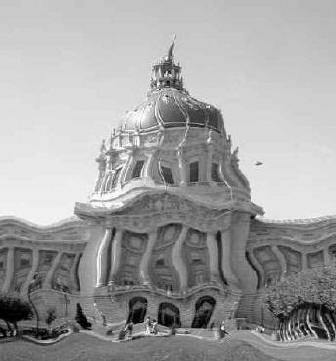 Same for the destruction of the imminently salvageable de Young Museum in Golden Gate Park. Same for the Golden Gate Stables. Same for the public housing in North Beach. In all cases, the public is told that whereas frame structures constructed 200 years ago in this country can be preserved with decent maintenance & an occasional overhaul, reinforced concrete structures must be replaced every 40 years or so. Are you stupid enough to believe that? Apparently. You keep voting for bond issues to replace perfectly serviceable structures.